Portable toddler beds are needed for every parent who have baby like us. Therefore, choosing a good bed for our toddler is always what we care for. There are many toddler beds in the market and they all have their own benefit. Yet, since we as parents need to move around, or even traveling often, having a portable toddler bed will be the best choice for us. As an experienced parent, I understand about this need ver well. That’s why I have compiled the top 10 best portable toddler beds from my research and experience to share with you. I hope it will be useful to you. Regalo My Cot Portable Toddler Bed made the top place on our list because it is highly qualitative, economical, and portable. Means, it is altogether a perfect baby bed for a reasonable price. The frames and legs are made of steel, thus they add a durability and stability to the cot. If you’re the one who has to travel a lot with one’s baby, get this baby bed. It is extremely portable and is ideally designed for the camping or any kind of sleepovers. You can easily fold it and carry wherever you want. These two are the same in functionality as well as quality. The only difference is color. If pink is your favorite, you’ll love this one. The waterproof mattress, made of soft nylon, never fades away no matter how many times you wash it. It comes in dimensions of 48L×24.5W×9H, so it can hold the kids up to 2-4 years old. The baby bed includes a fitted sheet which automatically fits the frame. Just unfold the cot and expand the sheet. Your baby bed is all set in just the minutes. The name says it all. ‘The First Years Close and Secure Sleeper’ is ideally designed for the newborns and can serve as a comfy bed for the kids up to the age one. It is completely different in design as compared to the above two baby beds. It is kind of a close bed which is secured by the 6.2 inches high frames from all the sides, so there is no chance of baby sliding off the bed. Since it is particularly designed for the infants, the mattress is made ultra-cozy. BABYBJORN Travel Crib Light- Silver is probably the costliest and the most stylish baby bed on our list. It costs approximately ten times more to the above-mentioned three baby beds but it has really something extraordinary to offer you. It is no less than a small home for your baby. The bed is secured by 5.5 inches high polyester walls from all the sides, so even if your baby is walking around playfully, he/she can’t get out of bed. These polyester walls are supported by the four solid and foldable legs. KidCo Peapod is a totally different baby bag but is unbelievably portable. It weighs only 2.45 lbs and this is what makes it the best fit for the outdoor travels. It functions in a different way too. You don’t need to do anything to assemble it. Just unfold the bag and put the baby inside. Then zip in the bag and you’re done. The best thing about this baby bag is that it assures UV protection, so you can use it outdoors without any worries. Another compact yet snug baby bag from KidCo. KidCo P4012 PeaPod Plus Infant Travel Bag is similar to KidCo Peapod in functionality as well design. The only difference is that it is a bit bigger and heavier than the earlier one, so it fits well for the kids up to 5 years of age. This crib is best for the crawlers as it makes enough room to move them around. The best thing, you can hold it up in minutes even without any manual or written instructions. Simple, elegant, big, and high quality- these words sum up the description of Leachco BumpZZZ Travel Bag. It is just like a normal mattress, so you can set it even in seconds. There is a 7-inch high foam padded frame from all the sides, thus it ensures full safety to the kids. Made of 100% polyester, the cushion is machined washable and portable. You can remove the center pad and carry it conveniently. If your kid is older than 2-3 years, get this one. 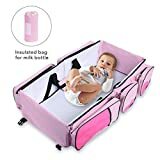 If you want an ultra-stylish, extremely portable, and snug baby bed in reasonable decent price for your toddler, KidsTime Baby Travel Bag is designed for you. The best thing about this baby crib is that it is equipped with the mosquito net tents which provide extra safety to the kid. These tents are attached with a zip panel, so you can zip in and out as per your convenience. It looks a bit complex but can be assembled easily. True to its name, this baby bed can be used for infants, toddlers, and as well as for the kids. If you want a durable, sturdy, big, and reliable baby bed, this sleeping baby bed would be the best fit for you. It is supported by the numerous robust steel frames which are connected in a criss-cross design adding an extra sturdiness to the cot. The sheet is removable, so you can first set the legs and then fold over the sheet. Baabyoo Baby Travel bed is a multi-functional baby bed. The best thing you would love about this baby is that it has 8 side zippers where you can keep all the belongings of your little one in one place. It serves as a small home for the kids. Baabyoo Baby bed looks exactly like a normal bag and functions the same way too. Zip out the front panel and put your baby. That’s it! The padded mattress is foldable, waterproof and can hold weight up to 10 kg. These are the top 10 best, warm and comfy baby beds. Each of them has different functionalities and looks but they all promise a peaceful crib experience to the kids. So, get the one that seems best to you.